At Pattaya Park Beach Resort, you need not to enjoy only swimming in the sea, Here, you are challenged to join in the thrill of entertainments on our water slides or swim around the whirlpool, the only water park of Pattaya. The only better thing than the inside of our rooms in the outside. - Any room reduce amendment/cancellation must be done in writing (by email / fax) to E-Biz Travel at least 14 working days prior to arrival (Not including Sat, Sun & Public Holiday). Failure to notify will automatically result in one night room charge of total room reserved. - During 1 Dec-28 Feb; Any room reduce amendment/cancellation must be done in writing (by email / fax) to E-Biz Travel at least 21 working days prior to arrival (Not including Sat, Sun & Public Holiday). Failure to notify will automatically result in one night room charge of total room reserved. - Main building; 261 guest rooms including suites, bungalows and townhouses. - Tower wing; 457 guest rooms and Junior suites. The hotel is fully faciliated with banquet and conference rooms, fitness center, sauna, snooker room, shopping arcade and exclusive bathing area by the beach. 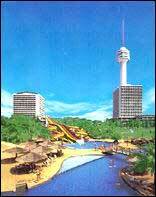 The first and the highest seaside tower and the Revolving restaurant located on the East Coast of Thailand. On the 52nd, 53rd and 54th floor- Revolving restaurants. Taste the international buffet lunch and dinner with seafood. - Pinnacle Revolving Restaurant - on the 53rd floor (Capacity : 250) - Meridian Revolving Restaurant - on the 54th floor (Capacity : 200) Provided a daily International Buffet for Lunch From 11.00am to 03.00pm and with Seafood for Dinner. From 05.00pm to 10.00pm. Banquets and meeting facilities, 24 hours Room Service, laundry service, baby cot + baby sitting, ample car parking space, tour desk, car Hire, shuttle bus for hire, shopping arcade, beauty salon, arts & gallery. 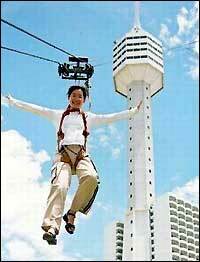 Pattaya Park Sky Shuttle and Pattaya Park Tower Jump, the best vision for a breathtaking views and the activity of challenge of the 170 meters high from the top of Pattaya Park Tower to the ground floor.